The Common Application is a common platform for under graduate admissions to USA. A lot of universities and colleges receive undergraduate applications via the website. Every student must make an account in order to apply. You can create an account well in advance in order to gain insight into the CommonApp portal. 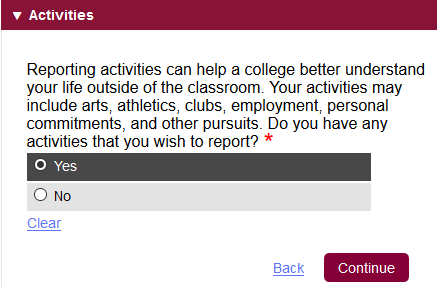 The first thing you need to do after you create a new account is add the colleges of your preference. You can do so by going to the ‘College Search’ tab. 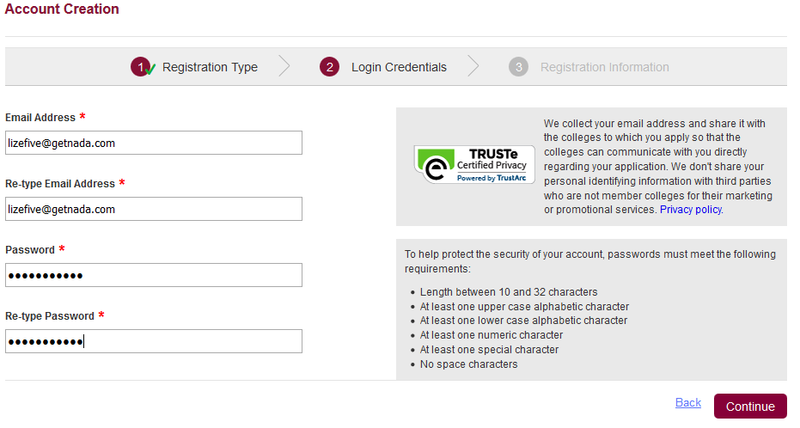 Type the full name of the college, no short-forms, and press search. You do not need to specify any other criteria. Select the colleges of your choice and add them to your college list. Selecting the colleges can be a difficult task as it is difficult to identify what colleges suit you best. This depends on a lot of factors in your profile. The most basic ones being your test scores and high school marks. The way you present yourself in the essay is another huge deciding factor. Extra curricular also play an important role in making your profile stronger. 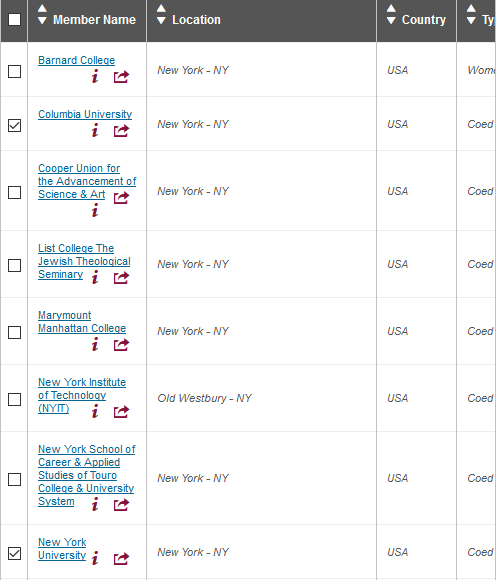 You can add up to 20 colleges on the common app website. However, we do not recommend adding more than 12. There are three types of colleges to select while applying, Reach, Target and Safe. Reach universities are the ones that you aim for which may be a little out of scope for you but the ones which is your dream university. Target universities are the ones that match your application. The average applicant that has been accepted has a similar profile as yours. Safe universities are the ones you are sure to get into. Even though there is no certain way of saying whether you will get into them, it is highly likely that you might with 75% odds in your favor. This is what the list looks like once you’ve entered the search criteria. You can select the colleges and click ‘Add’ to add them to your list of colleges. Once you have selected your universities, the form in which you must fill out all your basic information is under the ‘Common App’ tab. This is a lengthy form and will take you anywhere between 60-90 minutes to fill. You must fill this out with complete precision. 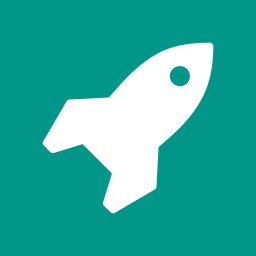 One feature that must be noted is that your application is automatically saved every 90 seconds. 1. 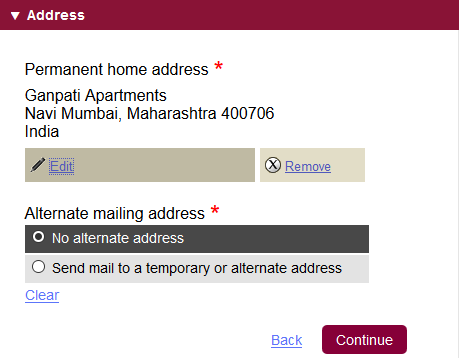 In the Address section, provide the address at which you will be available to collect the documents that will be mailed to you in the future. For example, once you finalize a university, they need to send you the i20 for you to issue your student visa. Therefore, it is important that you give the address at which you will be available to receive the packet from the university. 2. 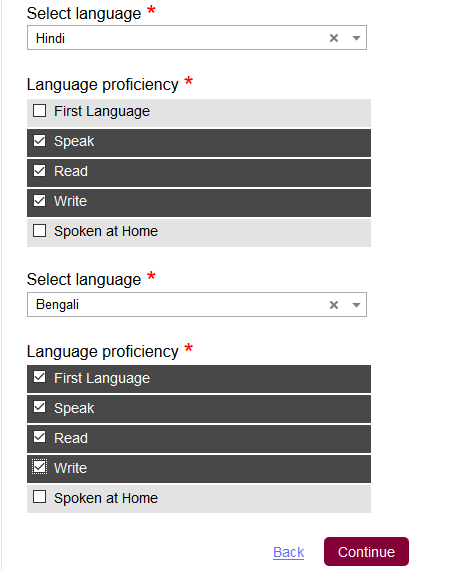 In the language section, make sure you include all the native languages you speak in. For example, Hindi, Marathi, Tamil, etc. 3. 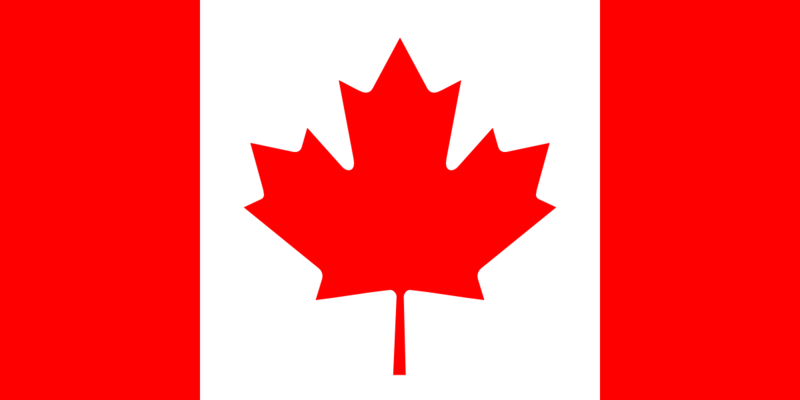 In the citizenship section, select visa type as F-1 Student. 4. 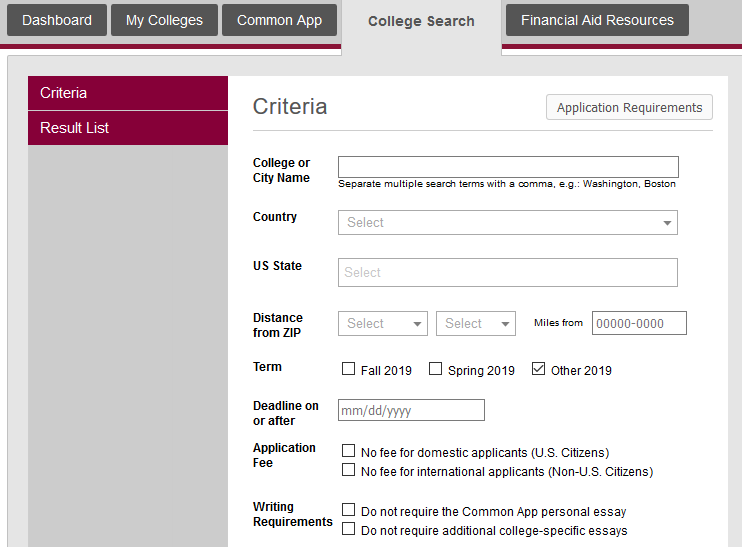 The Common App Fee Waiver section is used to indicate whether you are eligible in any way for your application fee to be waived. Select ‘Yes’ only if you have a code. The main purpose of the ‘Family’ section is to understand your background better. 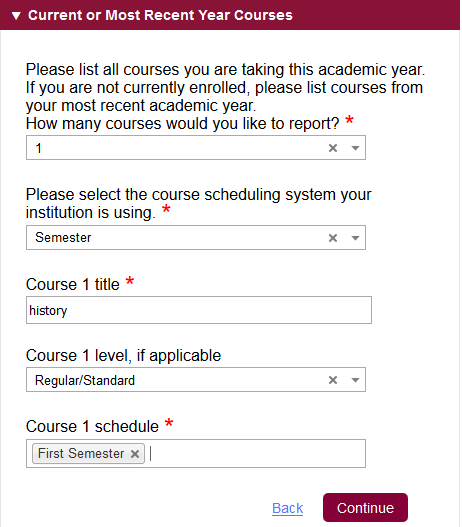 You need to fill out all your academic details in this section. Find your school in the pop-up window. 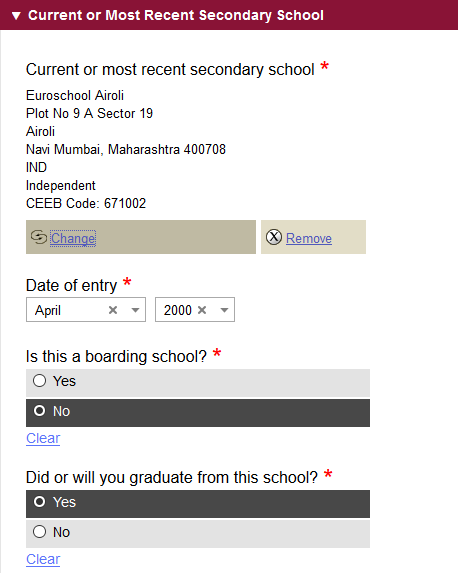 If you cannot find your school, then select the ‘I don’t see my high school on this list’ option. You will be asked to manually enter the details of your high school. Later in the section, you are asked to fill out the details of your school’s counselor. If your school doesn’t have a counselor, please fill in the details of the person (staff member, teacher or principal) who is going to be responsible to upload your transcripts officially. You, as a student, don’t have the authority to upload any transcripts or documents. Only the person in charge can upload them on behalf of the school. If you are unable to find a counselor to do this online, you can always courier the official documents to the University’s correct department. 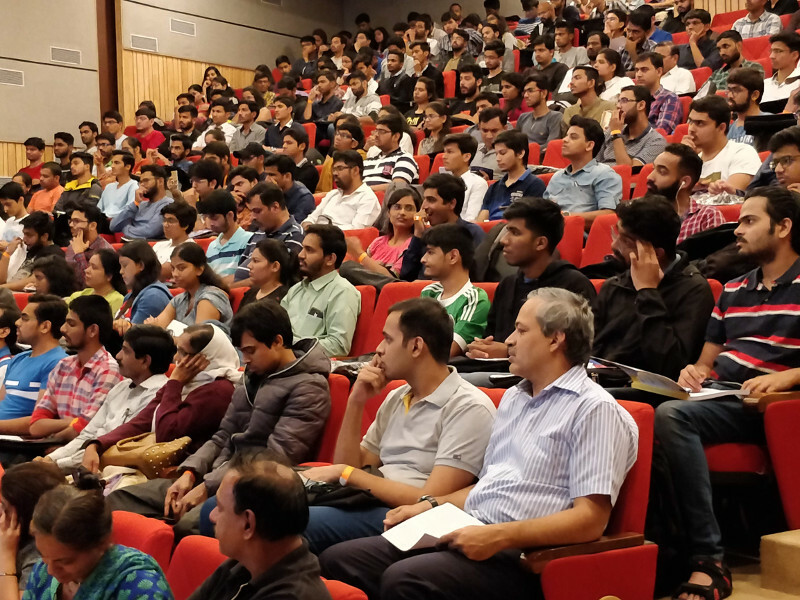 In many cases, it is possible that you have attended different institutes in 10th and 12th. 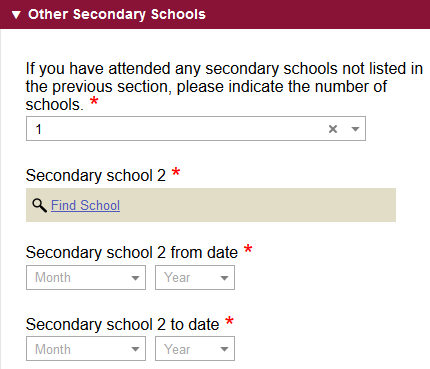 You need to specify this in the Other Secondary Schools section. It is important to mention all the schools/colleges that you attended in 9th,10th,11th and 12th. However, give the information of the counselor of your most recent institute. - In the colleges and universities section, mention whether you have received any credit from a college or a university. It may be because you attended classes there over the summer or attended an exchange program or attended the college for a year and are now applying with a gap year. It is not necessary to enter all the fields in the Grades section. The admissions officers of all the universities will automatically decide your standing based on your official transcripts. Just make sure to enter the approximate class size. In the Current or Most Recent Year Courses section, enter the details of your 12th standard subjects. In the next section, enter all the academic honors that you have received. Academic honors can include any subject prizes that you won, general proficiency awarded, olympiads etc. Community-based organizations are the organizations that help you for filling the application. An example of one such organization is EducationUSA. If you have taken their help while filling the form, you can mention so. The meaning here is that whether you have given any board examinations in order to be promoted to a higher standard. The answer here is Yes in almost all cases since all Indian boards require you to give a 10th as well as 12th board examination. You will notice that another section gets added called the Senior Secondary Leaving Examinations. Here you need to mention the number of times you have given your 12th board exams. Similarly, as you add the standardized tests (SAT, IELTS, TOEFL, etc), you will notice that more sections get added for you to fill in the information. Note: You may choose not to self-report the standardized tests’ scores. 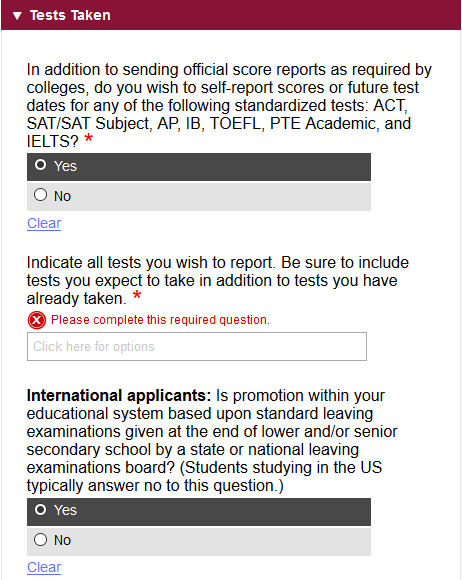 In either case, you must report your scores via the official websites. Mention all the activities that you have done in high school in this section. It is self-explanatory. In this section you will enter the common app essay that you will send all the universities you are applying to. Make sure that this essay isn’t a repetition of what is already mentioned in your application. It could be about an incident that happened to you or a problem you faced, or it could even be something positive that happened to you. It could also be as simple as having a conversation with your best friend which changed your perspective. Anything to let the admissions committee gain an insight to you as a person. Just keep in mind that the number of words should be more than 250 but no more than 650, stick to the word count as much as you can. This marks the end of the ‘Common App’ tab. The FAQs section is always on the right-hand side of the page and each section contains a video link on the top. Refer to either of these sections for help. If you still feel like you’re stuck, feel free to contact EducationUSA. They will share their expertise with you and help you solve your issue. Now, if you wish to continue filling out your application, click here for our article on Part 2 of filling the application. If not, you may log out. Read our article next time around where we talk about university specific requirements and application submission!